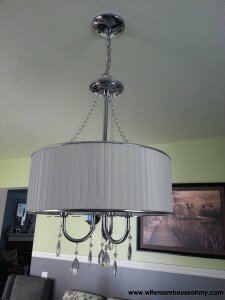 In our dining room, we have a light fixture that screamed 80s and FIX ME! 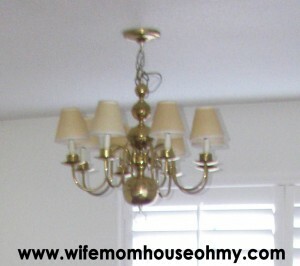 The imitation candle light fixtures were chipping, the shades had seen better days and in reality I am not a fan of brass/gold. Give me chrome, give me brushed nickel, even oil rubbed bronze but not shiny brass and gold looking anything. Both my husband and I agreed that we wanted to “change” it. What we couldn’t agree on was exactly how we wanted to change it or what to change it to. Aka pick your battles for those items you really feel are worth the digging in…I’m actually serious. In my opinion, compromise works one of two ways. Truly, you each can come to a consensus you are both comfortable with such if he wants Italian and you want Japanese and you both compromise and happily settle on Chinese. Or, what I think is probably more often the case, one person gets what they want and the other doesn’t. So compromises in individual situations are often about one person being willing to let the other have their way. Its not about being controlling or a martyr. Compromise, when looked at the global picture, is about give and take. I may give on this issue but he gives on another. Its equitable and when done right should leave both people satisfied. They may have not got everything but they feel good overall. This comes from knowing what battles are truly important to you and worth digging in your heels, like leaving the toilet seat up (my husband does not do this but I have two brothers and my rear got a cold wet awakening almost every night…ugh), or just letting pass as a give, like whether to plant this grass or that…its grass to me, whatever makes him happy. Enter our light fixture. I will admit that I am pretty much a hands on girl to EVERY design feature of our house, and very much have a strong opinion on what I want. Our light was no different. However, as much as I wanted a particular style light, I wanted the backless sofa for the living room in a very bold bright color more! 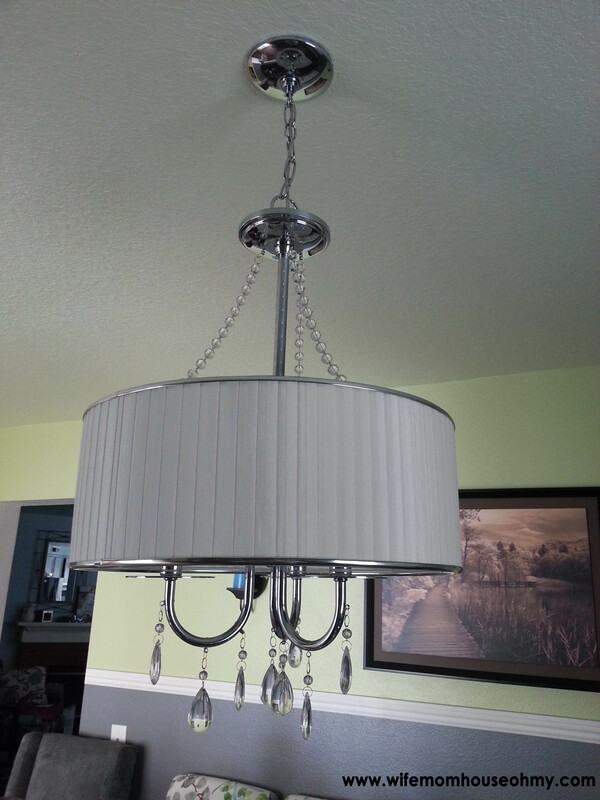 So seeing my husband’s face light up and his rather on going chatter about the light, I compromised and bought the “chandelier” (its not exactly a chandelier but I’m really at a loss of how to describe it other than fixture). Now, I’m not backing down on my sofa. In the end, even though I’m not a fan of the fixture, there are enough elements about it that I tolerate it, and I can be super happy with it knowing that the sofa I LOVE will be in my living room and my husband has his light…both in how it was changed and what it was changed to. Which brings me to installation. 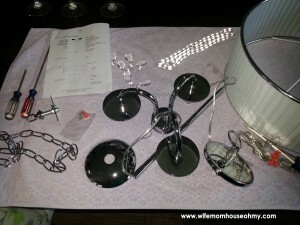 I already discussed the basics of installation of an electrical fixture like a ceiling light or fan in my post on Temporary Dream Kitchen: DIY Electrical and Lighting where you can find many basic tips and suggestions on changing light fixtures. However, this light fixture had some new lessons for us. Question: “How many Serars does it take to turn off the electricity?” Answer: The whole house full. I felt like I was in some old cheese standup routine as voices yelled back and forth, no not that one, you got it, nope you don’t, wait, and a few more. I tried to keep my amusement to silent laughter but it was tough. Make sure your electrical junction and circuit box is labeled clearly so that you know what switch turns of what area in your home. I’ve said it before, make sure you read your directions fully and all the way through before you begin your project. You will want to make sure you have everything you will need and every part the directions say you have. That said, I’m adding a new one. When you read your directions, do a mock run through of each step to see where you might get hung up (lol…no pun intended) in the installation. Trust me, your partner in construction crime’s arms will definitely appreciate your extra step and so will your frustration level. Make sure you know which wire is which BEFORE you start to put up the light. On this particular light, the black and white wires were both clear AND connected. Now the directions did differentiate between the “white” which was smooth and “black” wires which had a grove in it. However, once you split them, they both had a grove. 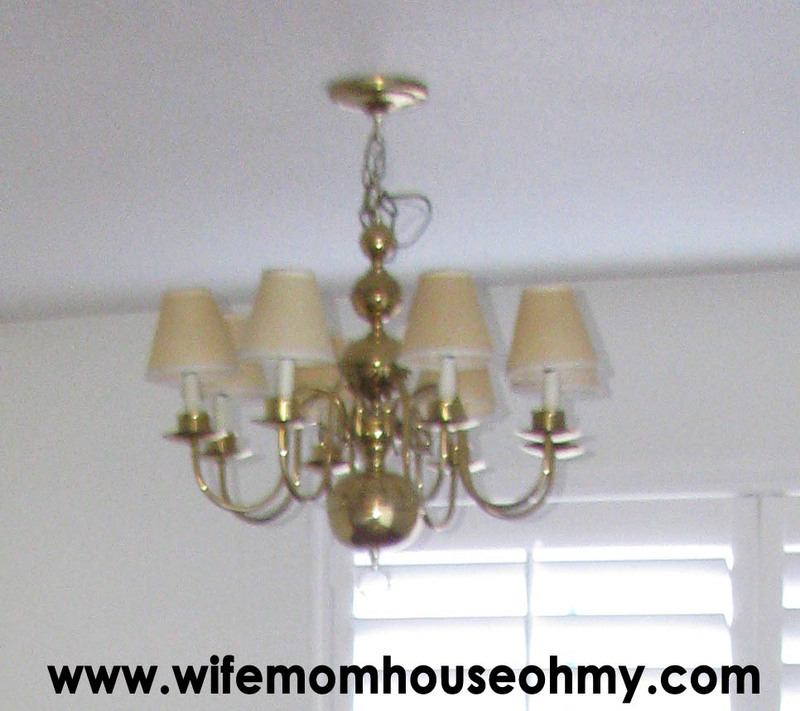 With the light fixture up at the ceiling, it made it difficult to fully distinguish between them. 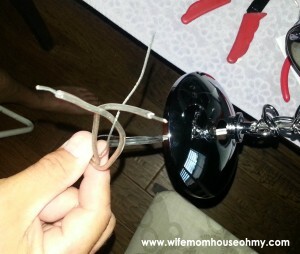 In hindsight, I would have taken a black Sharpie and marked clearly the black wire. Once we were on the ladder it was hard to tell which was which wire. Make sure you have a little brut strength with you. If I had been on my own, I would have had the LONGEST chain and wire ever. Try as I might, I could not budge the chain links to shorten it. My husband, who I can proudly say is quite strong, had a challenge. If not for him and his strength, the new light would be sitting, badly repacked in its box…waiting.